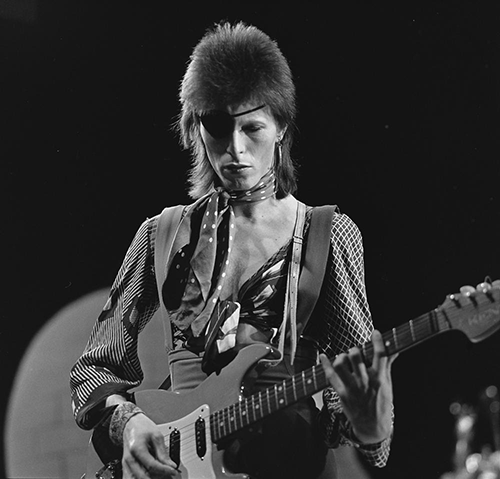 How influential was the late rock singer, actor and fashion icon David Bowie? A short list of big pop stars who borrowed his style or musical ideas includes Mick Jagger, Lady Gaga and Peter Capaldi, the current “Dr. Who.” Over a career that spanned the 1960’s through the 2010’s (Bowie’s final album was released on January 8, 2016, just days before his death) he was often imitated but never equaled. Bowie had an uncanny ability to stay out in front of pop music trends, taking on a variety of styles from folk-rock to punk to funk to jazz and making them his own. Like many market leaders, he was creative, unpredictable and unafraid to take chances. At the same time he remained accessible to old and new fans alike because whatever he did felt authentic. No one accused him of phoning it in. Bowie’s many characters, from Ziggy Stardust to Commander Tom to the Thin White Duke, were strong, solitary figures that were alienated from their cultures or environments. They resonated strongly with fans, especially adolescents struggling to find their own identity in life. At the same time he and his characters were so poised and charming that fans of all ages could relate to them. As a market leader, Bowie transformed his image many times over while making it look easy. That may have been his most transcendent talent of all. Excellent article about David Bowie! You captured the essence of his forward thinking and influential style that enabled him to appeal to diverse audiences!